Lyndhurst is a compact village and known as the capital of the New Forest since William the Conqueror established it as a royal hunting ground in 1079. It is a popular tourist location with many shops, cafes, restaurants, pubs, hotels, guest houses and B&B’s. The village also houses the Queen’s House, the New Forest Centre with a museum, gift shop, tourist information office and reference library. The Church of St. Michael and All Angels is a major landmark along with Bolton’s Bench. Lyndhurst has been visited by kings and queens staying at the Royal Manor, or the Queen’s House, throughout the centuries and is the most important building in Lyndhurst owned by the Crown in the New Forest. The Queen’s House which has also been called the King’s House, for the name changes according to the gender of the monarch, is home of the ancient Verderers’ Hall, the meeting place of the Verderers’ Court that dates back to the 13th century. The verderers’ are the guardians of the commoners and their Rights of Common within the UK. It is also home to the local headquarters of the Forestry Commission. The New Forest Centre is situated in the main car park and at the opposite end there is the Lyndhurst Community Centre offering refreshments on Saturday mornings and is where a wide range of events and activities takes place all year round such as antique auctions, craft fairs, book fairs, farmers markets and much more. The Church of St. Michael and All Angels, designed by William White, is situated on a mound overlooking the village and is the third church to be built on the site. It was built with red brick with yellow trim in the 1860’s and has a 49 metre brick-banded spire. The interior is of yellow, white and red exposed brickwork and the nave roof is decorated with life-size supporting angels. Alice Hargreaves nee Liddell, who was the inspiration for Alice in Lewis Carroll’s “Alice in Wonderland”, lived in and around Lyndhurst after her marriage to Reginald Hargreaves and is buried in the graveyard. Bolton’s Bench is a yew-capped hillock situated at the end of High Street on the outskirts of Lyndhurst. It is a natural knoll and not an enormous pre-historic burial ground. Bolton’s Bench was named after an 18th century Duke of Bolton called Lord Warden of the New Forest whose family were Master Keepers of Burley Bailiwick. Lyndhurst cemetery and chapel close to Bolton’s Bench was opened in the mid 1880’s when the parish church graveyard became full it is very well kept and the surrounding area of grassland is kept short by the commoners stock of ponies, donkeys and cattle making it a great place for a game of football or cricket or a family picnic. To the east of Bolton’s Bench and the cemetery is the wide open landscape of heath land, wetland and woods known as White Moor. During the First World War White Moor was a camp for soldiers before embarking for the fronts. Evidence of war is still occasionally unearthed and the remains of trenches used for warfare practice are still visible today. In October 1914 soldiers of the Immortal 7th Division, who had camped here, sailed for France heading for the battlefields of Ypres. Three weeks after going into battle only 2,380 of the 15,000 men were still alive. The Beaulieu River, formerly known as the River Exe, rises on White Moor and flows for 12 miles south-easterly across the forest heaths to the village of Beaulieu where the river becomes tidal and then continues to flow through the forest passing the village of Bucklers Hard and into the sea through the Solent. The tidal river at Beaulieu once drove a tide mill in the village and below the village at Bucklers Hard which was a significant shipbuilding centre the river is navigable to small craft. Many wooden merchant and naval ships, including Nelson’s Agamemnon, were built at Bucklers Hard. Beaulieu River including its bed is owned by Lord Montagu of Beaulieu. We start by walking from the White Rabbit pub and hotel following the road towards Lyndhurst centre to the t-junction. We turn left and walk down High Street passing all the shops etc until we reach the Lyndhurst Park Hotel on our right. We turn right, the road sign says Beaulieu, and immediately left at the Forestry Commission Bolton’s Bench sign. On the right you can see the yew-capped hillock of Bolton’s Bench. We head forwards on the tarmac track past the war memorial and the car park and bear left to the cemetery. At the cemetery gates we turn left and right following the cemetery wall through some trees for a very short way until we come to where the wall turns right again and with an open space on the left we turn left on the path through the bracken, brambles and gorse bushes. We pass behind a bench in an open space and then slightly right downhill through some more bracken, brambles and gorse bushes and just beyond we turn right at the t-junction of narrow paths and walk beside the bracken and a trench on our right. When we reach the end of the cemetery woodland we come to a cross roads of paths and keep heading forwards, basically following parallel to the A35 which is on our left, and after passing a clump of Scotch Pine trees we come to a criss-cross of paths. We take the left one of the two paths on the right and keep heading forwards on a raised path alongside two ridges. Soon we come to some trees on our left but keep heading forwards into the trees of Mallard Wood. On entering Mallard Wood we head forwards bearing right round the back of a fallen tree and head for the holly trees that have been browsed by the forest animals. We then come out into the open and walk straight forwards and follow the path as it bends to the right to a small bridge over a stream. We cross the bridge and turn immediately left following the stream through a copse. We come out into open grassland with the narrow Beaulieu River on our left and head to the bridge with a parish boundary stone set into the river bank, this is Longwater Lawn. We cross the bridge and turn slightly right keeping a short distance away from the river. After a few minutes we come close to the river again, this is where we see a herd of Fallow Deer including a white stag and a white doe in front of a line of trees on our right in the distance. We follow the river until the river disappears into a wood. We now bear left and right round the trees to a bridge over the river. We cross the bridge and take the left path of two and head forwards to Matley Wood. We enter the wood for a short way and take the path on the right to bring us out into the open and head forwards and keep heading forwards at a cross roads of paths until we pass a sign for Matley Wood Campsite just before the Beaulieu Road. At the road we turn right and walk close to the road for a while before we start to walk inland a little on a track called The Ridge but still following the Beaulieu Road until we arrive back at the cemetery, War Memorial and Bolton’s Bench. We now retrace our steps back through High Street and back to where we started. 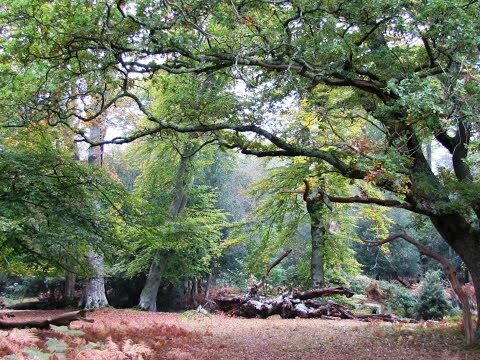 This is an easy flat walk over forest heath land, through woodland and beside the Beaulieu River on grassy paths and tracks. Approx 4.75 miles allow 1 hour 40 minutes using OS Explorer map OL22, New Forest. Start: Lyndhurst near the White Rabbit pub and hotel on Romsey Road (the A337). Lyndhurst in the New Forest, Hampshire. At the merging of the M27 junction 1 and the A31 take the A31 to Cadnam then at the roundabout take the A337 to Lyndhurst. There is the main car park, fees are between 70p and £5, at the Visitors Centre just off the High Street and there are three free Forestry Commission car parks near Bolton’s Bench on the outskirts of the village, just off the A35 going out towards Ashurst. There are public toilets at the visitors centre situated in the main car park just off the High Street at Lyndhurst. For refreshments there are many shops, cafes, pubs and restaurants in Lyndhurst. thought I may as well check things out. I like what I ssee so i am jᥙat following you. Look foгward to looking аt your web pabe again.